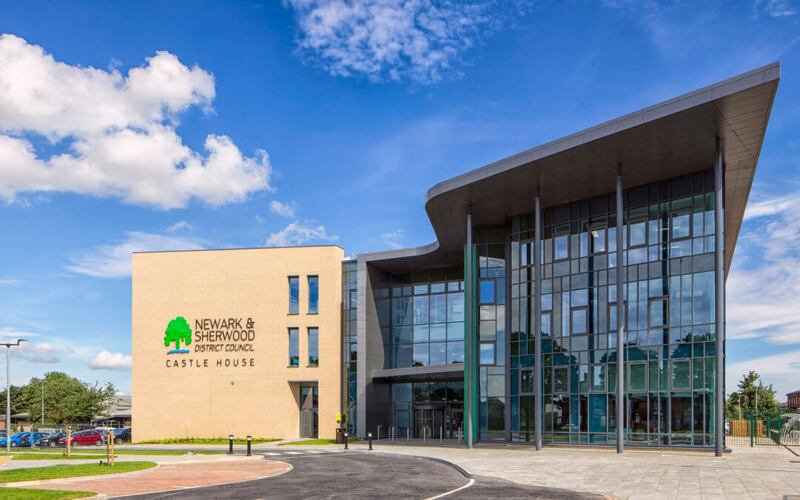 The new offices of Newark & Sherwood District Council, known as Castle House, have been short-listed in the Commercial category for the RICS Awards 2018, East Midlands. The project was entered into the awards by William Saunders. The Awards are run by the Royal Institution of Chartered Surveyors and recognise the most innovative construction projects across the country that have a positive impact on local communities. Led by Chris Houldsworth, Architect Partner, William Saunders undertook all the architecture, civil and structural engineering for the project, which has been praised for excellence in design and construction as well as its investment in the community and local stakeholder involvement at all stages. The three-storey, £6.3 million building provides Newark and Sherwood District Council and its partners with new centralised administrative and civic accommodation in Newark town centre to replace outdated and remote offices at Kelham. Designed around an H shape, the two wings on the upper floor provide flexible office space either side of centrally positioned core facilities which include meeting rooms, break-out and refreshment areas and touchdown meeting zones. Castle House is the realisation of a bold and innovative vision by William Saunders and was designed to sit comfortably within the context of the neighbouring historic building whilst being extremely cost-effective and energy efficient, with expected savings of £500,000 a year. In addition, 80% of the supply chain spend was with local businesses within 45 miles of the site. Chris Houldsworth said: “Newark and Sherwood District Council is very much at the heart of its community and this new building enables the Council to provide easy access to all of its services and other related agencies in a modern, cost effective and efficient hub. “It is a worthy contender for the award as it presents an approachable and welcoming face to visitors while also housing the various departments of the Council in a flexible and collaborative working environment designed to improve efficiency and deliver high value for money to tax payers. The building’s design maximises daylight penetration and natural ventilation which together with its solar protection, thermal mass, high levels of insulation and extensive arrays of roof-top photo-voltaic panels result in high energy efficiency and low carbon output. The winners will be announced on Thursday 3rd May at an Awards dinner at the Nottingham Belfry hotel.